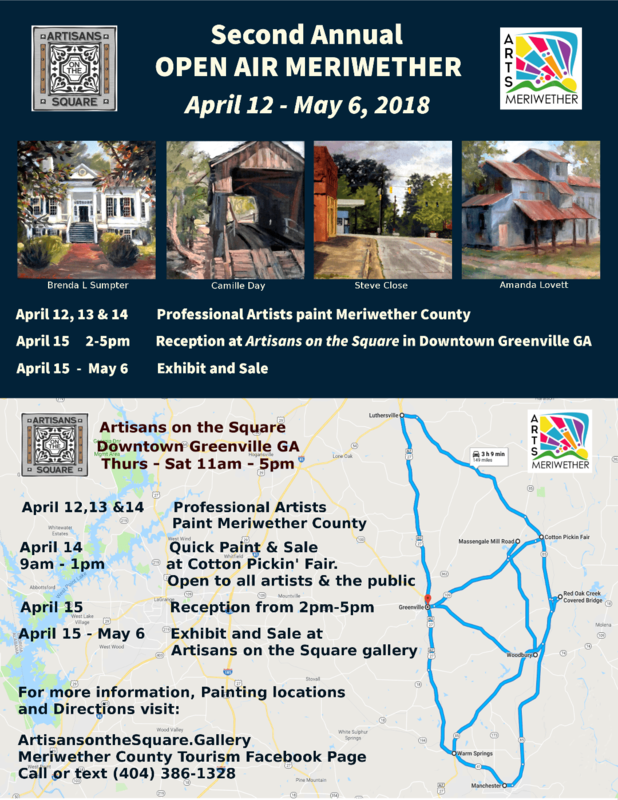 We are happy to invite you to attend and participate in the Second Annual Open Air Meriwether event which is co-sponsored by Artisans on the Square and Arts Meriwether. This year we added a “Quick Paint” event on Saturday morning, which is open to all artists to bring your easels, paint, sell to the public or just watch. Please open the link below for complete details on participating in this event. The public is invited to watch and buy directly from the artists for this one morning only and only the art painted in the two hours allotted to the Quick Paint. Clinton’s Catering of Greenville will be selling homemade biscuits with sausage and fried chicken plates. Fun for all! Please share with any other artists you know who might be interested.